W inter is the dormant season, but it doesn't have to be drab and dull. Along with our camellias, Loch Laurel Nursery carries a novel line of winter-blooming companion plants, specially sele cted for gardens in Camellia planting zones. Quantities are limited: Call or email the nursery for pricing and availability. 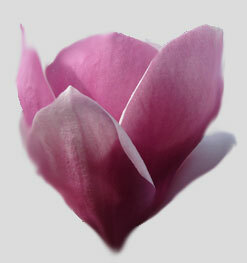 Deciduous Magnolia - One of the first signs that spring is near is the emergence of the Japanese Magnolias. This beautiful specimen has luscious, mid-season rose pink blooms with white inside, ten to eleven inches diameter. The tree grows from fifteen to thirty feet in full sun or partial shade with dark green summer foliage. 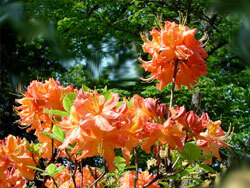 Native Azaleas - (Rhododendron austrinum and hybrids) - Yellow and orange fragrant flowers appear before the leaves in spring and provide a glowing display in the garden. Plants are grown from cuttings or seed from superior selections with large flower clusters. 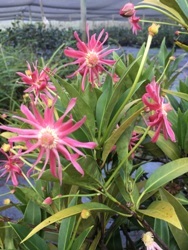 Anise 'Woodland Ruby' - Illicium mexicanum X flordanum alba - Evergreen shrub with aromatic foliage has ruby-pink starfish-like flowers which are larger than either parent and on long stems extending out from the foliage. It blooms over an extended period from May until frost. A Woodlanders Nursery introduction. Holly 'Emily Brunner' - Ilex 'Emily Brunner' - Emily Brunner is a hybrid between I. latifolia and I. cornuta with an upright to columnar growth habit. 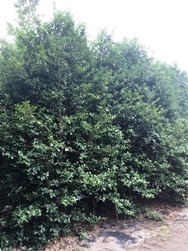 It maintains the dense growth habit and the light-green foliage typical of the Chinese Holly with little pruning. The showy yellow flowers are unusually striking for a holly plant. A row of Emily Brunner Holly makes one of the best screens available. Its tight growth habit, even in partial shade, makes it nice along the border of a property to provide protection from the wind. An excellent pollinator plant for bees. 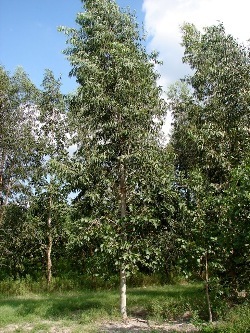 Eucalyptus amplifolia - A beautiful large growing eucalyptus to 100 ft with evergreen apple-green leaves. Trees grow tall and slender and provide the perfect dappled shade for camellias where it can be grown in USDA Zone 8b. Provides a good substitute for pines with deep non-competing roots. A great tree primarily used in forest plantations for pulp and biofuel. Used in Australia for honey production. Southern Highbush Blueberry 'CAMELLIA' - Vaccinium virgatum 'CAMELLIA' - Can you believe it - a blueberry variety named CAMELLIA. Camellia's large, firm, sky blue berries are rated excellent to superb for flavor and aroma. A vigorous upright grower with high productivity, Camellia is an excellent choice for homeowners and U-Picks. Released by the University of Georgia in 2005. Ripens late April to May. 450-500 chill hours. Recommended pollinator is Palmetto.